A corporate scandal unfolding around one of the largest businesses coming out of South Africa, Steinhoff, has become a major cause for concern. It threatens to wipe out hundreds of billions of rand invested on behalf of many people – rich as well as ordinary South Africans. Sibonelo Radebe asked Jannie Rossouw to interrogate the saga. 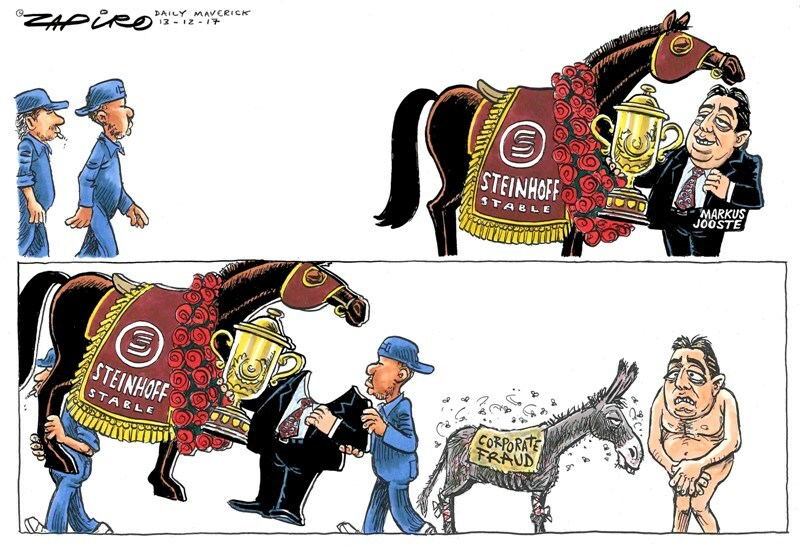 Steinhoff Stable. More of Zapiro’s brilliant work available at www.zapiro.com. What do you read from these allegations of corporate corruption? The Steinhoff scandal is disturbing because it points to a serious gap in the checks and balances in the investment management space. A scandal of this magnitude should not have occurred if the systems with their multiple layers were working. It’s still early days but it seems as if a multiple of highly paid professional layers failed investors. This includes auditors, asset managers and non executive directors who in their different roles should ensure that the company’s accounts are as close to the truth as possible. Steinhoff share price collapsed by more than 90%, wiping off nearly €10 billion in shareholder value in about three days following the resignation of the company’s CEO, Markus Jooste, after news that German prosecutors were investigating the company for alleged massive accounting fraud. Steinhoff is listed on both the Johannesburg Stock Exchange and Frankfurt Stock Exchange. Steinhoff shares were the darling of most fund and asset managers in South Africa and across the globe. We must ask questions why these entities, which draw enormous fees, failed to pick up the alleged irregularities when it seems like they should have done so if they were doing their jobs properly. How big is the damage caused by this scandal? It’s still early days but some people are already tagging this scandal as the biggest corporate failure in the history of the Johannesburg Stock Exchange. With more than 40 retailing brands in over 30 countries, Steinhoff was positioned as one of the largest companies by market capitalisation on the exchange. Its market value of close to R300 billion as recorded earlier this year placed it in the top 10, flanked by other South African corporate giants like media giant Naspers, luxury products specialist Richemont, resources giant Anglo American, petrochemicals firm Sasol as well as two big banks Standard Bank and Firstrand. If Steinhoff’s stock doesn’t recover the capital losses of share investors who bought at inflated prices will be massive. Steinhoff started off as a South African based company but built itself into a global retail business with significant interests in western Europe. As a result it attracted prominent investors. In South Africa, these include the Public Investment Corporation which invests on behalf of the Government Employees Pension Fund among other public entities. The Public Investment Corporation is reported to hold 10% of Steinhoff’s total shares which means its losses reached more than R10 billion after the share price collapsed. It is therefore of the utmost importance and in the interest of all involved – particularly direct and indirect investors – that the Steinhoff matter be brought to a swift closure. Swift closure should be followed by legal action against and punishment of all those implicated. How wide spread is such behaviour? Each time a major scandal surfaces, regulatory gaps are identified and new measures are put in place to plug the apparent holes. But the scandals keep coming. South Africa has had its fair share of corporate scandals with the most recent being a list of companies linked to the Gupta family inspired state capture. Big names like Naspers, KPMG, McKinsey and SAP have been caught in the extensive web of corruption allegedly driven by the Guptas who have close ties to the country’s president. Some commentators have linked the Steinhoff saga to the broader ethical challenges facing South Africa. The integrity of some people in key positions of authority in both the public and private sectors is being questioned. This includes the country’s President Jacob Zuma who stands accused of violating the oath of office. Despite the best efforts, it’s impossible to regulate for integrity and ethical behaviour. The one effective way that behaviour can be changed is through legal process and by means of tough punishment. At this point in time we are still unsure of the degree of corporate rot in Steinhoff. Numerous allegations have been made, but the world now waits for the company’s delayed audit report to see the full extent of possible corporate fraud. Steinhoff must act swiftly in informing shareholders and other stakeholders about the true financial health of the company. The Board of directors of Steinhoff is responsible for the financial health and the financial reporting of the company. The problems at the company resulting in the serious decline in the share price, raise the question whether the Board members should continue to hold office. Under the watch of the current Board a massive destruction in shareholder value took place. No Board replacing the current one can do worse, as there is simply hardly any shareholder value left to destroy. Will the current Board do the honourable thing and step aside? If fraud is proven, I want to see Steinhoff executives serve jail terms. They have caused immeasurable harm to many people. This is the only way in which unethical and fraudulent behaviour can be out-rooted and integrity restored. From a proper investigation of the affairs of Steinhoff, possible regulatory gaps should also be identified and eradicated. Nevertheless, no structure of regulation and supervision can replace the single most important requirement for successful business conduct: Ethical behaviour. In South Africa we need ethical behaviour at all levels, namely the government, businesses and civil society. Jannie Rossouw, Head of School of Economic & Business Sciences, University of the Witwatersrand. This article was originally published on The Conversation.